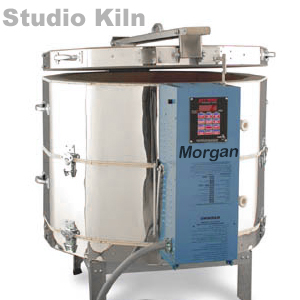 The Morgan Kiln has become the most popular kiln we sell to serious ceramic businesses. Its most significant advantage over similar capacity larger kilns is the lower opening, making it far easier to load than the deeper studio kilns. It is only 22 ¼” deep, yet larger width inside than the 29" deep Studio Two kilns. Do not worry about the Morgan not fitting through your front door! It is designed to be easy to dismantle, carry in, then reassemble. You'll notice the clips on the sides in the pictures holding the separate parts of the together. Watch the video below, or download this 'how to' leaflet. Rated to 1287C, the Morgan will comfortably fire porcelain and stoneware, yet still on a regular 240 volt, 50 amp circuit. For the much lower cone 06 firings of the Ceramic Café or Pottery Party business this means your kiln and elements have masses of power to spare, giving fast firings if required, and much longer average element life. The top row of bricks in the firing chamber are 2" high and do not hold any heating elements, this makes the rim of the chamber less susceptible to damage during loading than a weaker grooved brick. The massive, 12-sided Morgan kiln with its' 12 key digital controller is a profit centre of the busy ceramic studio. It eats up stacks of low-fire ware as well as porcelain and stoneware. It is rated to a full cone 10. At a cost per cubic foot, the Morgan is one of the most economically priced standard kilns made for us by the world leading Paragon kiln manfacturer. During busy seasons when orders are backlogged, you will be grateful you own a dependable Paragon kiln. Studio owners call these kilns real work horses. The Morgan is a popular choice for schools and colleges who require a large efficient chamber, but also need the reliability and ease of use that come with the computer controller. The Morgan kiln uses deluxe 3" thick firebrick throughout, the sidewalls, the reversible brick bottom, and the 3" thick lid. The massive lid is heavy, however is so easy to lift with the exclusive, patented Paragon counter-balanced LiteLid. The clever LiteLid reduces the strain on you as well as the kiln body, saving it from the pressure of the lid, and in turn lengthens the life of the firebricks. The 24" wide metal stand for the kiln supports the brick bottom with framing that is 4½" wide across the top of every side. The stand will accommodate the Kiln Vent if you require one, which can always be installed at a later date after the kiln is up and running. The stand is rock-steady, with thick 16-gauge frame and heavy 12-gauge legs. Busy studio owners love the convenience of the 12 key computer controller. With a few keystrokes, you can fire to a pyrometric cone program, or design your own firing profile with up to eight stages. The computer has multiple programmable elements to it, setting delayed starts, having the kiln tell you how much electric was used on the past firing, temperature offsets can be entered, cooling can be controlled and so many, many more features. Use as many oir as few of them as you are comfortable with. The controllers now fitted onto these kilns give you total control over every firing. If you look at the firebrick seams in any of our kilns, you will see they are so tight they are barely visible. This means your kiln is rigid and will have a much longer life than looser fitting makes. The heavy duty full formed steel base strengthens the kiln to take heavy loads. The switch box is generously louvered to allow cooling air circulate freely with a minimum of dust, and can be easily dropped forward for maintainance by the removal of just 2 screws, giving access to most of the working parts in the kiln. When the time comes when you need spares, probably elements or a relay, give us a call, Hobby Ceramicraft hold massive stocks of spares which can be despatched, often within minutes, helping you get your kiln back up and running (along with your business) in as short a time as possible. You'll get a year's warranty on the kiln, 2 years on the computer, and advice from us for as long as you need us! Easy Access Switch Box hinged at the bottom, the switch box opens forward for easy maintenance. A folding support arm holds the box in the open position. The Sentry computer controller is mounted at the top of the switch box within easy reach, not fixed to the wall in the hot environment above the kiln. Operate it when you have the kiln loaded with the pressing of a couple of buttons and the computer will take care of the rest. 1 1/2" Square Posts, 8 each 1", 2", 3", 4", 5", 6"
This furniture kit will allow you to stack 3 full shelves in the kiln. Along with the base of the kiln that will be 4 areas to load onto. Any more shelves and you are likely to be blocking out the radiant heat from the heating elements. We have chosen a quantity of shelves that we feel would best suit this model and include in this kit. The kiln will fire very hot, but remember shelves wider than 15" may be fired to cone 8, regularly firing hotter you may see the shelves warping therefore, we cannot guarantee shelves against warpage.